Clemson is getting a playoff first-timer and an unfamiliar stadium for its fourth consecutive College Football Playoff appearance. The ACC champion Tigers (13-0, No. 2 CFP) will play Notre Dame (12-0, No. 3 CFP) in the Cotton Bowl on Dec. 29 at AT&T Stadium. &apos;&apos;We&apos;ve got an unbelievable amount of respect for Notre Dame here at Clemson, and obviously a couple of years ago we had an epic battle in a hurricane,&apos;&apos; coach Dabo Swinney said. Clemson is getting a playoff first-timer and an unfamiliar stadium for its fourth consecutive College Football Playoff appearance. The ACC champion Tigers (13-0, No. 2 CFP) will play Notre Dame (12-0, No. 3 CFP) in the Cotton Bowl on Dec. 29 at AT&T Stadium. 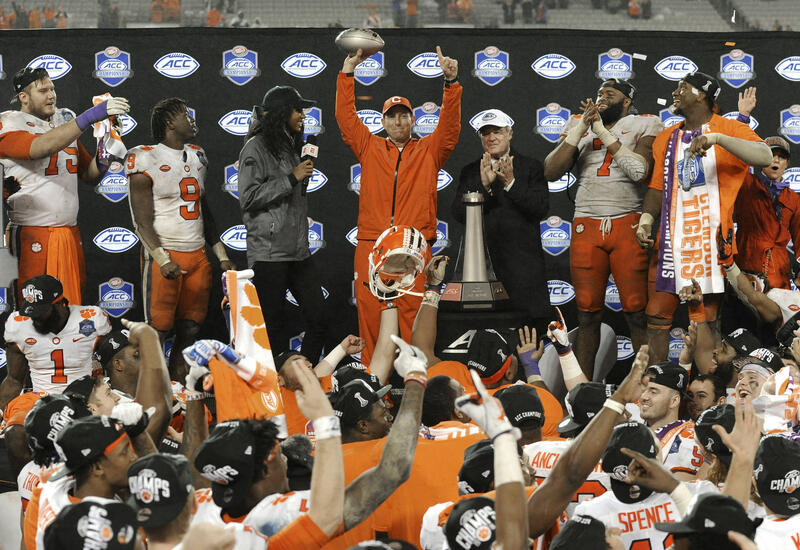 "We&apos;ve got an unbelievable amount of respect for Notre Dame here at Clemson, and obviously a couple of years ago we had an epic battle in a hurricane," coach Dabo Swinney said. You are currently browsing the archives for the Notre Dame Fighting Irish – NCAAB category.